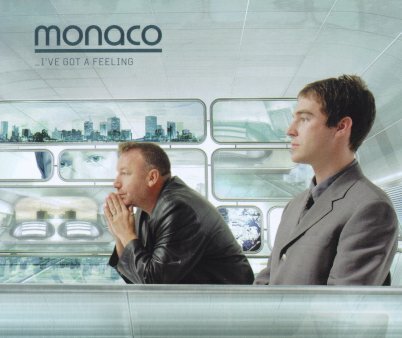 Monaco have had to pull the release of their forthcoming single in UK "I've Got A Feeling" after sample clearance could not be obtained in time for a loop used on one of it's b-sides, "Heaven Seven". The single has already been pressed and the b-side could not be removed or changed in time for release. After taking advice from Warner Chapell, Monaco's publishers, they had no choice but to pull the single. ** It's an in-house 'Edit' promo with a hand written sleeve and a Radio Promotions Company sticker on the front of the case. The sticker has the release date of 31st July 2000. 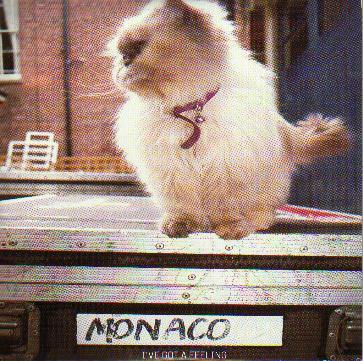 "I've Got a Feeling" is the latest material from Monaco since 1997's debut acclaimed album, "Music for Pleasure". Yes people, Hooky and Potts are here again, out of their Polydor deal and now with Papillon, with a summer anthem that is classically Monaco. The boys have been busy writing and David Potts has been busy being offered jobs in Oasis!!!! He hasn't taken the job and all the better for us because they are sounding better than ever and if the previous hits are anything to go by "I've Got a Feeling" we are in for a great Summer.